Undeterred by the lukewarm reception to its first attempt at a smartphone-tablet hybrid, Asus has returned with the Asus Padfone 2. It's sturdier, quicker, and much better specced than its predecessor, but the Asus Padfone 2 hasn't left us entirely convinced that this is a worthwhile concept. With the launch of the Windows 8 OS and devices such as the Microsoft Surface, the potential for hybrid smart devices that can fulfil multiple roles at least appears to be out there in the public consciousness. 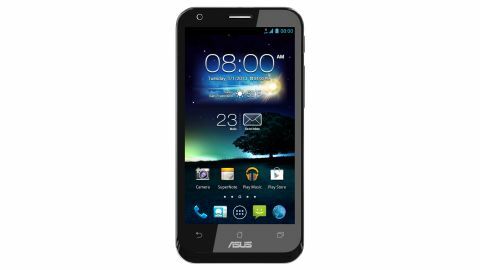 Now could be the perfect time for Asus to enjoy a measure of success with its own convergent take. The Asus Padfone 2 is primarily a very capable Android smartphone, which just so happens to have the (almost) unique ability to slot into an included tablet dock and become a competent 10.1-inch Android tablet. As such, we'll discuss the Padfone 2 as a phone first and foremost, but will highlight where notable features or changes are made by slotting it into the tablet peripheral. Asus clearly means business with the Asus Padfone 2. Packing a 4.7-inch 720p Super IPS+ display, a 1.5GHz quad-core Snapdragon S4 processor, 2GB of RAM and a 13-megapixel main camera, this is an Android 4.1 Jelly Bean smartphone that stands toe-to-toe (for specs at least) with the Google Nexus 4 and the Samsung Galaxy S3. Of course, the Asus Padfone 2's somewhat tardy arrival in the UK has meant that it won't be considered top-of-the-range for long - not with the Sony Xperia Z and the HTC One virtually upon us. Indeed, with Asus itself announcing the Asus Padfone Infinity at MWC 2013, the Padfone 2 is on borrowed time as top dog in its own home. But right now, it's a highly capable device in its own right. Our first impression when holding the Asus Padfone 2 for the first time was one of quiet approval. It's a solidly built phone that mixes a somewhat mid-range feel with several high-end flourishes. On the one hand you have the classy iPhone 4S-like metallic rim that tapers to a fairly narrow point at its bottom edge, effectively acting as a runner for the tablet dock. You also have what feels like a sealed body - though it's actually just a very well concealed removable back - which, combined with a weight that's only slightly heavier than the Samsung Galaxy S3 and HTC One X, leaves the Padfone 2 feeling robust and well made. At 9mm (0.35 inches) thick, the Asus Padfone 2 has pretty much the same girth as its 4.7-inch rivals, too. On the other hand, the other materials feel a little plasticy and occasionally cheap. The rear cover has an unusual textured concentric circle design that aids grip but, in the off-white colour scheme of our test unit at least, almost has a chintzy hairbrush look and feel from some angles. This sits at odds with a glossy plastic front portion that feels decidedly Samsung. The aforementioned metallic rim also breaks up its own continuous machined curve with what looks like a separate component along the bottom edge, which looks a little tacked on and almost composed of a different material. In terms of ports and buttons, the Asus Padfone 2 is a bit of a mixed bag. Its hardware keys are excellent, with the power key sitting just above the volume rocker on the device's upper-right-hand side. These feel truly classy in terms of their positioning, metallic composition and degree of give. The three capacitive buttons on the lower-front face of the device are par for the course for a modern Android phone, though they look a little murky when lit up, like there's a thick layer of gel coating them. It's the ports that are a little disappointing here. The top-centre-mounted 3.5mm jack is no problem, but the proprietary micro USB port on the bottom is an inexplicable inclusion. It's ugly, fiddly, and while existing micro USB connectors will fit, they don't do so securely. Some will also no doubt bemoan the lack of a microSD slot for memory expansion purposes. We're not usually bothered by such things when there's a choice of 32GB or more internally (as there is here), but it feels like more of an issue here when Asus is presenting the device as a tablet as well. Somehow we just associate 10.1-inch Android tablets with more capacity and flexibility. The real star of the show here, though, is the Asus Padfone 2's 4.7-inch display. Yes, 720p is soon to be superseded by Full HD 1080p displays, but in the here and now this is one of the crispest smartphone displays we've seen. Colours are accurate, text is sharp, blacks are reasonably black and whites are just vibrant enough without coming across as over-saturated. In fact, our only issue with the Asus Padfone's display is a software issue - the auto-brightness setting can be overly stingy at times, particularly when viewing in low ambient light. If our impressions of the Asus Padfone 2 phone's feel and design are largely positive, then our impressions of the tablet peripheral are considerably less so. On the plus side, we're impressed by the actual docking mechanism, which puts us in mind of classic cartridge-based video game consoles (minus the need to blow on the connectors). The phone slots into place reliably and solidly, with the screen pointing inwards. However, the tablet portion in isolation just feels cheap, flimsy and overwhelmingly plastic. There are notable creaks when handling it, which is possibly down to the fact that the bulk of the extended pad's innards are concentrated in the phone portion. The tablet effectively just houses a 5,000mAh battery, making it somewhat hollow. This leads to the tablet feeling a little awkwardly balanced in the hand, too. Holding the device in one hand while interacting with the other places undue strain on the former, thanks to the weight being concentrated in the middle of the device. It's also undeniably ugly - a cheap, plastic shell with a pearlescent sheen to the rear portion and a nondescript black slab feel to the front. It's reminiscent of the first generation of Android tablets, which is not a good thing. The two key hardware buttons for power and volume are stiff, and feedback is poor - particularly on the almost unmoving volume rocker. Even more disappointing is the performance of the 10.1-inch screen, especially when compared to the equivalent excellence of the phone portion. This display is distinctly low-res by modern day standards, at a lowly 1280 x 800. The picture looks grainy and washed out, especially when switching from the bright crispness of the phone - as you inevitably do whenever you use the tablet portion. Our overall first impression is that the Asus Padfone 2 just doesn't look or feel like a £599 (around US$905/AU$885) 32GB device, regardless of the fact that you're effectively getting two devices in one. For that price your could buy a Google Nexus 4 and a Google Nexus 10, each of which possesses that uber-desirable, premium feel. Of course, you wouldn't get to use a single phone contract for both, which is the Asus Padfone 2's one big boast. It's not an inconsiderable one either.